For anyone out there that wants tropical vibes with a more minimalist feel, this wedding invitation suite is for you! These tropical minimalism wedding invitations from Swell Press (one of our super talented Designer Rolodex members!) are fresh, modern, and elegant all at the same time. 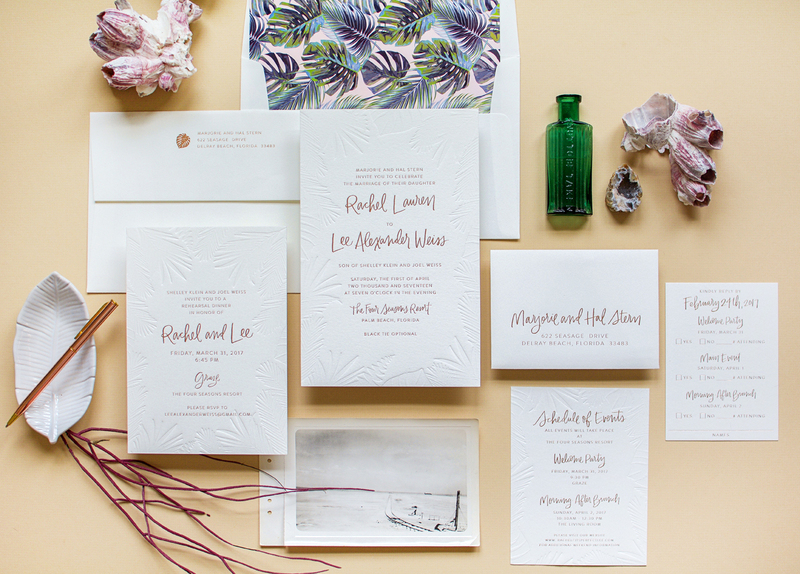 With subtle blind-impression (no ink) letterpress printed palm fronds and stunning calligraphy by Nicole Miyuki printed in rose gold foil, and a vibrant envelope liner, there are so many beautiful details to love in this gorgeous suite! From Britt: Where do I even begin with this invitation suite! Our ‘tropical minimalism’ suite was actually one of my first designs years ago, when I first started designing and printing. Today, it is still one of my favorites. The original design had a clean sans serif font in black, but when Rachel and Lee reached out to me, they wanted something a little more elegant and softer, with a dash of whimsy for their sophisticated wedding in Florida. Custom brush calligraphy by Nicole Miyuki was a perfect touch for just that, and rose gold foil took the elegance of the suite to the next level. The main invitation was printed on thick, 100% cotton 220lb Crane’s Lettra in Pearl White, with the insert cards on 110lb. If anyone needs any evidence of how much an envelope liner can impact a suite, this is a perfect example! The palm frond pattern perfectly complements the suite but definitely adds a pop of boldness when the recipient first opens the envelope, and the subtle rose gold monstera leaf on the flap is the most perfect addition. As much as I LOVE color, this refined, classic and somewhat minimal design has such a huge piece of my heart.We now offer it as a semi-custom design, which means we’ve done various versions of this suite with different color foils from gold to copper, various colors of letterpress inks for the text, and various fonts. This particular suite was slightly oversized from your typical A7 size to A9 (5.5″ x 8.5″ instead of 5″ x 7″), allowing room for the various insert cards and even more of a visual impact. Swell Press is one of the talented, hand selected members of the Oh So Beautiful Paper Designer Rolodex – you can see more of Britt’s work right here! Or visit our wedding invitations archive for more custom wedding invitation ideas! so exciting to see this on here! thank you!